The efforts of the men and women dedicated to disseminating and using scientific and medical knowledge have been equally critical – the editors, printers, librarians, nurses, doctors, engineers, information specialists and business people at the centre of scientific and health publishing. In the decades preceding World War II, Elsevier was not the prosperous company we know today. From 1880 onwards, the Robbers family had built a publishing house founded upon a strong set of ideals: Elsevier’s Illustrated Monthly (1891-1940) promoted Dutch literature and visual arts, while Winkler Prins’s Illustrated Encyclopaedia (1884-1993) spread general knowledge among the Dutch people. At the same time, director Herman Robbers’ involvement in the Dutch accession into the Berne Convention allowed Elsevier’s authors a great deal of freedom concerning the copyrights to their books. Of course, this was not necessarily good for business. By 1930, the company was stuck with a large stock of unsold books and an enormous bank debt. 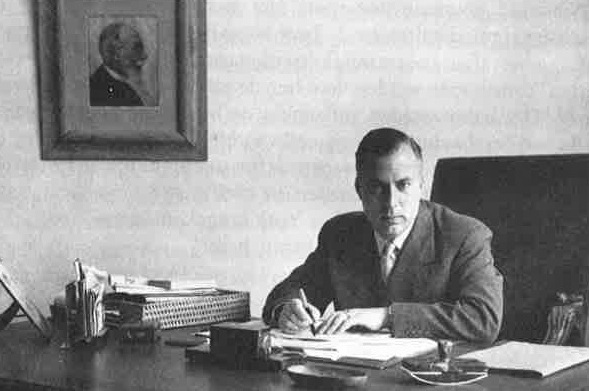 Under the leadership of J.P. Klautz (1904-1990), Elsevier’s prospects slowly turned as the newly appointed director put a strong focus on the development of new projects for an international market. The first step was to sell books to the Dutch-language part of Belgium, where the encyclopaedias were especially well received. The next was a direct result of the political developments in Nazi Germany. During one of his trips to Leipzig, Klautz got the idea to publish the work of (German-language) authors who had not been able to have their books published in their native country. Because other Dutch publishers were already working on them, Elsevier was not attracted to literary manuscripts. Instead, Klautz decided to publish German technology, medicine, and history. From 1936 onwards, about fifteen scientific books appeared, including The Technology of Aluminium and its Light Alloys (1936) by A. von Zeerleder, and Säuglingskrankheiten (Infant Diseases, 1938) by H. Finkelstein. None of these books were very successful, so after the Anschluss and Kristallnacht events of 1938, Klautz announced that no more contracts would be made for the publication of books in the German language. During the next years, Elsevier acquired the English translation rights to various German scientific handbooks, mainly in the field of chemistry. In this process the Amsterdam bookseller Maurits Dekker, who was trained as a chemist, served as an advisor. It was Dekker who recommended Elsevier to fully focus on establishing an English language scientific catalogue. Highly uncommon at the time, Elsevier opened offices in both London (1939) and New York (1940). They would not serve their purpose until 1945, since the German occupation of the Netherlands forced Elsevier’s plans for international expansion to go underground. The most important was Elsevier’s Encyclopaedia of Organic Chemistry. 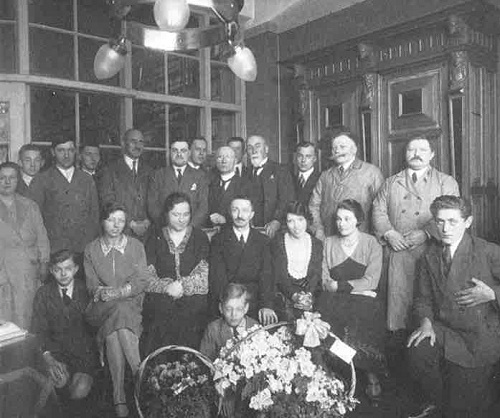 In 1937 Klautz had managed to gather 35,000 guilders for this project – a huge investment, considering Elsevier’s yearly profit amounted to 120,000 guilders. The Encyclopaedia was designed as an English-language, modernised version of F.K. Beilstein’s Handbuch der organischen Chemie (1881) – a Springer publication. Although the first part was set to be released on the May 1st, 1940, the threat of war caused Elsevier to keep the Encyclopaedia a secret. After all, a project authored by Jewish scientists, and meant to compete with a German publication could most definitely count on Nazi intervention. Elsevier’s Encyclopaedia was officially announced in 1946. Although it found praise among chemists – including the Dutch and American Chemical Societies – it did not become a success. Ironically, Elsevier sold the encyclopaedia to Springer in 1955. Up until that time only three parts had actually appeared. Despite this financial disappointment, the project had been crucial in the rise of the Elsevier Scientific Publishing Company – especially from the point of goodwill and public relations. It had been one of the reasons Dutch biochemist Hendrik Westenbrink approached Klautz with the concept for Biochimica et Biophysica Acta (1947) – a journal with a truly international board of editors, and still a staple in Elsevier’s catalogue today. For further reading, Dorien Daling’s excellent study into Dutch science publishing, Stofwisselingen (Zutphen: Walburg Pers, 2011) is highly recommended. English-language readers will enjoy C.D. Andriesse’s Dutch Messengers (Leiden: Brill, 2008), in which Elsevier plays a large role as well. That the Elzevir family took pride in their mark is undisputed; what they intended it to mean is less clear. 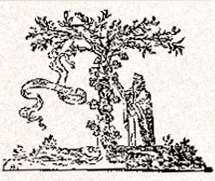 Although most scholars agree that the elm represents the tree of knowledge, they cannot agree on the meaning of the intertwined vine. 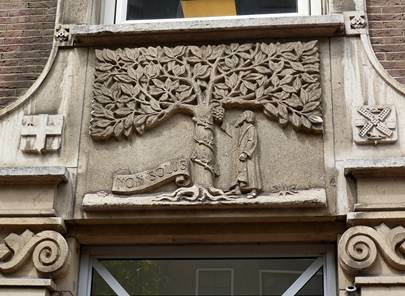 The Parisian librarian Adry posited in 1806 that the elm tree entwined with the grapevine symbolised the bond between brothers Isaac and Abraham Elzevir and that the old man, a hermit, symbolised the seclusion of study. 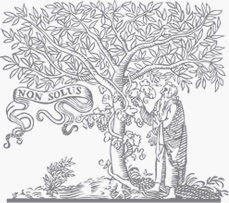 However, contemporary art historian Lucy Schlüter suggests more persuasively that the old man represents a wise scholar, a philosopher – evoking Erasmus’ image of Socrates sitting under a tree in a rural setting delivering fruitful and inspiring lectures.